Due to the recent drop in oil prices, there is a strong interest in the influence of the shale revolution on the global supply and demand of hydrocarbon fuels. Consequently, the attention of many economists and industry analysts is drawn to the technological, institutional and regulatory aspects of hydrocarbon production from shale deposits in the USA. The authors analyze factors facilitating the shale gas revolution in the USA, and find that in addition to the obvious factors, such as high prices for gas at the beginning of the 2000s, an important underlying factor was the high level of institutional development in the USA. This was characterized by a legal system that recognized property rights in mineral resources, the existence of a wide variety of business entities operating in the oil and gas sector (including small businesses), and a favorable tax regime. The article presents the results of econometric modeling that traces the USA’s transition from almost exclusively extracting conventional gas to the extraction of unconventional gas. Key Words: Unconventional gas; Shale gas revolution; Innovative development; Institutions. A number of authors have conducted research and published articles analyzing governmental policies towards companies that develop unconventional hydrocarbon resources. M. Hass and A. Goulding (1992) presented an analysis of the historical and potential influence of the tax stimulation policy on the development of unconventional gas resources in the US (Section 20, production tax credits). On the basis of their empirical research, they demonstrate the importance of this stimulus in decreasing financial risks and boosting the commercial attractiveness of costly projects using unconventional resources. Paul L. Joskow (2013) highlights the absence of gas price regulation at the well-head, the unbundling of gas supplies from pipeline transportation services, and the carrying out of reforms in licensing and price regulation for gas transportation as among the main factors behind the significant increase in shale gas production. It was precisely the economic platform based on these factors that became an incentive for the integration of separate innovations in horizontal drilling, hydraulic fracturing, monitoring and control of deep drilling equipment for the cost-effective shale gas development. Wang and A. Krupnick (2013) conducted the first investigation into what regulatory, economic and technological factors played a key role in the shale revolution. They stress several factors that had the most influence on shale gas developments. Amongst these factors, it is worth highlighting the government policy directed at stimulating private investment into the unconventional resources sphere, the advanced private entrepreneurship in the oil and gas industry, private land and mineral rights ownership, the high gas prices in the early 2000s and other factors. For example, analysts from the Breakthrough Institute, А. Trembath, J. Jenkins, T. Nordhaus and М. Shellenberger (2012), look at the role of US federal government policies, including the government’s research programs in devising technologies for the cost-effective development of shale gas fields. They conclude that innovations in hydraulic fracturing and other key technologies for the unconventional resources’ development were largely a result of R&D programs undertaken both by the private and the public sectors. Looking on the successful American experience, several authors conducted analyses of the possibilities for cost-effective extraction of shale gas in other countries. For instance, J.M. de Hoz, T. Lanardonne, A. Maculus (2013) assess the prospects of the Argentinian shale industry, based on an analysis of the regulatory environment and the legislative and tax base in the unconventional hydrocarbons sphere. J. Gorski (2012) conducted a similar analysis for Poland. Recently the topic of hydrocarbon extraction from unconventional sources has become extremely popular. The high level of interest is justified. Due to the rapid oil price decrease since July 2014, there has been strong interest in the changing dynamic of the global hydrocarbon balance of supply and demand, specifically how it is influenced by technological breakthroughs in developing unconventional hydrocarbons. Most observers believe that one of the main reasons for the drop in oil prices was a rapid increase of US oil production which in 2014 which reached the level of the other two biggest producers, Russian and Saudi Arabia. Greater reliance on domestic production decreases US demand for imported oil and hence puts downwards pressure on the oil price world-wide. In addition, the rapid increase in shale gas production accompanied by a drop in domestic gas prices in the US has increased the share of gas in the overall energy mix in the United States thus further strengthening its energy independence. All in all, the shale revolution in the US is starting to have a major impact on global energy markets. Consequently, the attention of many industry analysts is drawn to the commercial, technological, institutional and regulatory aspects of hydrocarbon production from shale deposits. As shale gas and oil technologies are gradually spreading worldwide, there is an increased likelihood that they will be having a stronger impact on the global energy balance in the not so distant future. According to BP forecasts, by 2030 demand for primary energy resources in the world will have risen by 36%, reaching the volume of 17 billion tons of oil equivalent per year. At that time, fossil fuels will account for three-fourths of the energy market, with oil keeping the leading position and an increasing demand for gas. The main conclusion of this forecast is that in the foreseeable future the world will still require hydrocarbons. Moreover, it will require more of them. Hence, there is the question of oil sources to satisfy the demand. It is increasingly difficult to discover new oil and gas deposits in areas that have a conventional geological structure. According to World Energy Outlook, for the last two decades the volume of newly discovered reserves of conventional oil and gas has fallen below the production. Consequently, as conventional hydrocarbons become less easily accessible, the share of new unconventional deposits in overall reserves is increasing. The incredible success of the USA in unconventional shale gas production has led to a significant reassessment of world hydrocarbon resources. Whereas just 10 years ago the share of unconventional gas in the natural gas structure was less than 5%, the unconventional world reserves and resources are currently five times higher than the world reserves and resources of conventional natural gas. And despite the fact that great reserves of shale gas were known for a long time, shale gas was recognized as an economic asset in the international fuel and energy community only at the World Gas Conferences in October 2009, when US experiments proved that cost effective large-scale production of this resource was possible. In the USA during the period 1990-2012, shale gas production rose roughly eightfold, from 277 to 2319 billion cubic feet. In 2012 in that country, 24 billion cubic feet of natural gas were extracted from shale per day (37% from total gas production). The development of these resources has helped the US increase gas extraction by almost 20% and become a world leader in its production. Moreover, due to the increase in shale gas production, the USA expects to be a net exporter of gas by 2017. Figure 1. Shale gas production in the USA, in billions of cubic feet. Figure 2. World resources of technically recoverable shale gas, in billions of cubic feet. China is estimated to have the largest reserves of shale gas in the world. By 2030 shale deposits are expected to have contributed up to 20% of the gas produced in China. The government of China took its first steps in adopting this type of resource only in 2011 when it held the first tender for gas extraction. Initially, licenses were granted only to state-owned oil and gas companies. However, at the end of 2012 independent oil and gas companies, and foreign ones co-operating with Chinese oil and gas companies within joint ventures, also received licenses. To stimulate shale gas production, the Chinese government has decided to eliminate government regulation of shale gas pricing. In addition, some companies receive subsidies. Despite these efforts, China has not yet had much success in shale gas development. According to the data available on 14 drilled wells, only one (Yang 101) well (CNPC) has generated considerable gas flow. In 2007, Poland undertook active efforts to develop shale resources. 109 licenses were granted to both Polish and foreign companies from 2007 to 2011. However, no tangible progress in production has yet been observed. According to World Energy Outlook, the costs for shale gas production in Poland can be 50% higher than in the USA, accounting for 180-360 US dollars for 1000 cubic meters. Such foreign companies as ExxonMobil and 3Legs Resources have already declined to work on most shale gas deposits in Poland. There have been no examples of successful shale gas development in that country yet. Argentina holds the second largest shale gas reserves, after China, and is the largest gas producer in South America. Given that since 2005 gas production in the country has been declining while demand has been increasing, Argentina has serious incentives to develop shale resources. The government of Argentina has developed a number of programs for stimulating shale gas development, inter alia a higher price ceiling for its realization in comparison to conventional gas. These measures have already attracted a lot of foreign companies to the industry, including ExxonMobil, Apache, Pluspetrol, and Total, along with national YPF. According to EIA, unconventional gas accounts for about 5% of the total annual gas production in Argentina. Russia also has considerable shale gas reserves; however, the question of commercial viability of their development is currently open. There are considerable explored reserves of conventional gas in Russia, for which production costs are much lower than for shale gas. For those reasons there have been no real projects to develop shale gas resources in the country yet. Meanwhile, the experience of others in developing unconventional deposits in general — specifically, shale oil, bitumen and heavy oil — is essential for Russia. From this point of view, an examination of the institutional climate and controls that have facilitated the shale revolution in the USA may be very useful for stimulating innovations in Russian subsoil resources management. We see from all this that despite the efforts undertaken in various countries, only the USA has achieved real progress in shale gas development. Argentina is an exception, but its first success is not as significant in scale as the USA’s. The BP statistics confirm this fact. According to its data, the USA accounts for 99% of the world’s shale gas production. Moreover, this situation is not going to change significantly in the medium term (Figure 3). According to the Wood Mackenzie data, the possibilities for cost effective development of unconventional gas outside the USA and Australia (projects for coalbed methane development) are extremely limited. For most projects, IRR does not exceed 5% (in rare cases 10-12%) after payment of all taxes. Given that the success of shale gas development outside the USA is very limited,,it is important to understand what factors have led to the shale revolution in the USA. On a technical level the shale revolution has become possible by technological innovation, namely breakthroughs in three important areas: horizontal drilling, hydraulic fracturing of geological formations, and seismic information gathering and digital analysis. However, the improvement of the technologies mentioned above does not represent the end of innovation in the US shale industry. In just the past 2-3 years, further technological solutions have been developed which have allowed shale gas projects to approach conventional gas projects in rates of return. This commercial component was a key factor of the shale revolution. For example, in the USA cluster drilling as well as hydraulic re-fracturing of formations are widely used to solve the problem of the rapid loss of well productivity after 2-3 years of development. This technological solution allows production to remain at a high level without the constant drilling of new wells, with a positive effect on the project economy. In order to improve horizontal drilling efficiency, geosteering has been developed, which allows the optimal drilling direction and the location for hydraulic fracturing to be chosen in a real time mode. Moreover, the application of a mixture of gases for formation fracturing is currently being tested in the USA to solve the ecological problems related to hydraulic fracturing as well as to save water. If successful, this technological solution may help overcome the problem of water resource scarcity when developing shale gas in countries where this problem is present. From the analysis mentioned above, one can conclude that the USA not only developed the technologies that made shale gas extraction commercially viable, but, in addition, it has been constantly improving these technologies as well as developing new ones. However, the question is still vital, why it is the USA that had the technological breakthrough that made the shale revolution possible? Why were those technologies not developed, for example, in China, where the largest volume of shale gas is found? And why is it the USA that keeps developing new technological solutions; for example, the use of a mixture of gases for formation fracturing? To answer the question, let us consider the US sectors in which key technologies were developed. Most key technologies were invented in the private sector. For example, a successful combination of hydraulic fracturing of geological formations with horizontal drilling was initially used by Mitchell Energy to develop the Barnett deposit. Moreover, some key technologies, such as horizontal drilling and 3D seismic imaging, were initially created by private oil companies to explore and produce oil rather than shale gas. Thus, it may be concluded that by the beginning of the shale revolution in the US oil and gas sector, a favorable innovative environment, capable of reacting rapidly to the changing trends in the industry, had been established. And this innovative environment has, in turn, led to a breakthrough in shale gas production. What is the reason for the innovative development of the US oil and gas industry? There is no doubt that high prices for gas stimulated production, inter alia from unconventional sources, at the beginning of the 2000s. However, the governing factor was the high level of institutional development, which led to an environment favorable to innovations in the country. Some of the main factors of institutional development in the USA that are worth highlighting are the right to ownership of subsoil resources, the variety of types of business entities operating in the oil and gas industry (including the developed sector of small businesses) and a favorable tax regime. An efficient policy of incentives in combination with efficient regulation has also played a significant role. These institutional conditions deserve examination in detail by governments of other countries, especially countries with resource economies. Each further section of this article deals with one of the conditions that enabled the innovative development of the industry and the breakthrough in shale gas production in the U.S.. In the USA since the end of the 1970s, the government has been undertaking a number of measures aimed at stimulating natural gas production, inter alia from unconventional sources. The main ones were the liberalization of prices for gas, tax benefits, and partial industry restructuring. The main factor that forced the US government to draw attention to unconventional sources was its heavy deficit of natural gas in the 1970s. That deficit occurred as a result of the particular measures introduced in the natural gas market by the US government in the 1960s and 1970s. In particular, the government established a price ceiling below the equilibrium market level; that led to a production deficit and a decrease in reserves. To solve the problem of gas deficit, the government decided to liberalize prices for gas extracted from unconventional deposits. This principle was fixed in law in article 107 of the Natural Gas Policy Act. Initially it allowed for price deregulation for natural gas with high production costs from Devonian shale, coalbeds, and zones with abnormally high formation pressure. So, since November 1, 1979, the prices for gas extracted from unconventional sources have not been regulated. That became an incentive for companies developing that type of resources. As a result of price deregulation, from the early 1980s unconventional gas was sold at much higher prices than regulated conventional natural gas. It is also interesting to note that according to article 107, shale gas per se was not initially included in the list of unconventional sources to which price liberalization principles were applied. This was probably the reason Mitchell Energy initially registered its Barnett shale deposit, from which the shale revolution started, as a gas deposit of dense rock. One more important measure that gave companies an incentive to develop unconventional gas sources was concessional taxation. According to article 29 of the Crude Oil Windfall Profits Tax Act, which came into force in 1980, those producing gas from unconventional resources, namely from Devonian shale sediments, formations of low permeability, and coalbeds, received an allowance of about 18 US dollars for 1000 cubic meters. If one considers the number of drilled wells of conventional and unconventional gas during that period, one can see that unconventional sources – coalbed methane, gas from dense rock, and gas from shale – account for three out of four drilled wells. Undoubtedly, this law encouraged increased technological innovation in the industry. Tax benefits for unconventional hydrocarbons within the framework of article 29 were eliminated at the end of 1992. However, this did not lead to as significant a fall in unconventional gas production as could have been expected. The annual unconventional gas production was 3.6 billion cubic feet in 1994, which accounted for 20% of the total natural gas production in the USA. The number of wells drilled after the repeal of the tax benefits also dropped insignificantly. Figure 1 shows that in their first decade, price liberalization together with tax benefits resulted in a significant increase in gas production from unconventional sources – from 0.5 billion cubic feet in 1980 to 3 billion cubic feet in 1990. However, the main benefits were granted to develop such areas as coalbed methane and gas from dense rock (Figure 1). The question then is: what initiated the steep increase in the production of shale gas in the second half of the 2000s? Why did the fall in the production of coalbed methane and gas from dense rock not happen after the repeal of the tax benefits? The reason for that is that the policy of price liberalization for unconventional hydrocarbons and tax benefits led to an expansion in technological innovation which, in turn, resulted in an exploration boom. The accumulation of this knowledge and innovation, in parallel with strong private property institutions, allowed US companies to carry on developing coalbed methane and gas from dense rock after the repeal of the tax benefits. The same measures enabled a breakthrough in shale hydrocarbon production. It can be concluded that unburdening some conditions for business (in particular, reasonably low taxes and free pricing) is a significant factor in starting to develop unconventional sources – especially at the stage of subsoil user companies accumulating experience. It is important that these measures on a government’s part would not result in their directly sharing high production costs with a subsoil user (e.g. via subsidies) but rather to encourage innovative development of the industry, as happened in the USA. However, low taxes and free pricing are not the only requirements for achieving good results in innovation. There should be developed institutions, both in and outside of the industry, a low level of corruption, as well as good conditions for independent companies with narrow specialization. These factors will be described below. One of the key aspects determining development of subsoil resources in each country is the way access to natural resources is regulated. This includes the ownership structure as well as effective and simple rules for licensing hydrocarbon exploration and production. In this sense the US subsoil resource management system is unique. The unique feature of the USA is that the ownership of subsoil resources initially resides with a landowner. Landownership automatically grants the right to operations related to exploration, development, and production of mineral resources underneath the earth’s cover. This makes shale gas (along with any other mineral resource) the property of the landowner and stimulates him to develop these resources efficiently. Landownership also allows such operations as selling, leasing or the ceding of development rights to share risks. Thus, the free market allows for faster development of deposits and effective reactions to changes when trends in the oil and gas market shift. The development of the Barnett shale deposit by Mitchell Energy is an example of how the US landownership laws influence the companies’ operations. At the end of the 90s the company managed to obtain a considerable capital inflow, leasing large tracts of land with the right to shale gas mineral resources development at a low price at the initial stage, and then selling the rights for the development of that land at much higher prices, when the active development of shale gas resources started in the industry. The profits, in turn, allowed Mitchell Energy to invest in technologies of shale gas production. The US system of treating land and natural resources as private property provided the opportunity to lease land at relatively low prices and sell the rights for development at higher prices. It is also important to note that the US procedures for access to resources excel in their simplicity and organized nature. The licensing system, in particular the procedures for obtaining a drilling permit, provides a company with great freedom to maneuver. The maximum land area that an investor can lease is large enough: 2560 acres (10.36 sq. km) in 48 states and 5760 acres (23.31 sq. km) in Alaska. This is especially important in case of developing shale gas deposits, as these resources are usually located on large territories. Large, medium, and small companies have equal access to licensing in the USA. The system thus facilitates independent companies’ development. It is important to note that one single license for the full development of a deposit (both exploration and production) is issued in the USA. It guarantees a lease-holder and a landowner the right of exploration and further production as well as follow-up exploration of minerals. In most countries these stages require individual licenses, which makes the procedures difficult and deprives the soil user of guarantees to continue working on a specific area of land. Auctioning for land distribution in the USA is efficient enough. Open auctions are held quarterly and the list of the licenses offered for areas of land is published 45 days prior to bidding. Besides auctioning, land lease agreements on the development of oil and gas deposits can also be concluded without tendering, if, for example, an auction has not brought results. This measure facilitates the issuance of a great number of licenses. Thanks to effective and simple procedures, in the USA an average of around 60%-80% of the licenses that are issued (Figure 4) are distributed annually. By comparison, in Russia, this indicator did not exceed 20% in 2012 despite the fact that the total number of licenses set for auction is roughly one-tenth of that in the USA. 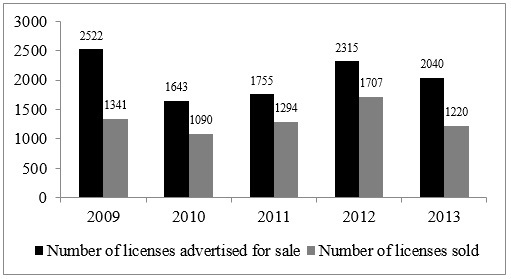 The total number of licenses issued in the USA in 2012 was 63000; in Russia, less than 3000. Figure 4. Dynamics of the licenses issued in the USA, pieces. Developing such a significant acreage in the USA has allowed companies to accumulate huge experience in deposits development. Further, this experience rendered shale projects profitable due to more economically viable technologies. Besides, companies managed to accumulate a lot of exploration data. This information significantly reduced the costs for exploration later. It confirms the analysis of the dynamics of the drilled prospect wells in the USA. Figure 5 shows that the number of prospect wells in the period 2008-2011 has trended downward, despite the fact that it is in this period that the most significant increase in shale gas production is observed. Figure 5. 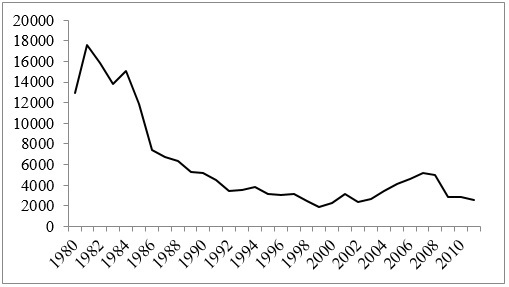 Dynamics of changes in the number of prospect wells in the USA. Thus, it can be concluded that strong private property institutions, as well as effective and simple rules and regulation for subsoil resource management, played a significant role in innovative development of the oil and gas industry in the USA. One of the main factors of the shale revolution was the developed sector of independent small and medium oil and gas companies. Generally, the US oil industry is an example of the successful coexistence of vertically integrated oil companies and small oil-producing enterprises. Below, we will consider the role of companies in each of these two categories. The assets of the oil and gas sector are of a narrow specialized nature and are not used in any other operating activities. Therefore in order to achieve an economy of scale, companies in the oil and gas sector are often integrated into large vertically integrated oil companies at the stage of the active development of the oil-and-gas province (a single territory with common geologic structure). This integration helps put the available resources in place more effectively. Therefore the establishment of vertically integrated oil companies, first of all at the stage of the active development of an oil-and-gas province, is natural and economically feasible. However, the same highly specialized nature of the assets enables vertically integrated oil companies to restructure into smaller companies when the province becomes mature, with deposits decreasing in volume as well as new categories of hydrocarbons being developed (for example, shale gas or oil). Narrow and specific knowledge and skills are required when small deposits with high depletion of reserves or totally new types of reservoir are being developed. As assets of the oil and gas sector are changing in their structure, and oil and gas provinces are maturing, the role of competition and flexibility is increasing. These company characteristics become more significant than the economy of scale, which is no longer effective. Summarizing, it is worth noting that the industry is more efficient where companies with various functionalities operate. At this stage the US oil and gas industry is definitely mature. For the last decade there have been no large deposits discovered in the USA – excluding Alaska. Production from stripped wells is about 70% of the total US production. Taking all this into account, for effective development the US industry requires the developed sector of independent small and medium oil and gas companies. In 2012 in the USA, there were around 13,000 small oil companies, which accounted for more than 54% of hydrocarbon production. It is small companies that are currently providing much of the increase in hydrocarbon production in the USA. Most of them produce deep in the continent from hard-to-recover and residual reserves of marginal wells or small deposits. This kind of operation requires a company to take an individual specialized approach to each deposit and sometimes to each well, and to develop innovative technologies to ensure that the rate of return is at an acceptable level. As a result, US independent highly specialized companies have accumulated varied engineering experience. One such company was Mitchell Energy, which managed to apply efficiently innovative technologies to develop shale gas at the Barnett deposit. Later it was these independent oil and gas companies that became the main driver of the shale revolution in the USA. What allowed the USA to create the most extensive network of independent oil and gas companies in the world? As mentioned above, an effective institutional environment (in particular, the ownership and licensing system) and low barriers for small companies to enter the industry played key roles. In addition, the flexible taxation system in the US subsoil resources management allows companies to improve their methods of production from difficult deposits (for example, ones with a high extent of depletion). We will consider this aspect in the next section. There are three types of taxes in the US oil industry: local, state, and federal. Each type is aimed at creating conditions for effective and innovative development of the resources. Depending on the area, the rate of the local tax varies between 0.1% and 15% of the cost of capital assets. The state tax consists of production royalty and corporate income tax. The amount of royalty is announced in the course of tendering for land and varies between 0.5% and 12.5% of the market value of the produced product. This flexible system allows the government to receive more revenue from sections with a high expected rate of return, but at the same time to keep the tax burden reasonable for sections which are more difficult to develop. The US federal tax is levied at the rate of 34% of the profit of a subsoil user company. The topic of comparison of a profit tax with a revenue tax in the subsoil resources management sector is significant (the latter is used in a majority of countries). The format of this article does not allow us to discuss this topic in detail; we will just say that the experience of a number of countries shows that a profit tax is a more flexible and more effective fiscal tool, which allows companies to react better to changes in market conjuncture and raw material reserves structure. As a consequence, subsoil user companies increase their profitability, even as the taxes they pay are higher. It is important to note that the US Oil and Gas Production and Conservation Act of 1995 provides for flexible taxation depending on a well’s production rate. It gives incentives for developing deposits with high depletion. Additional tax benefits are provided for land sections where wells have a production rate of less than 3.4 t per day and a water content of more than 95%. To develop these sections with a reasonable rate of return, land users should apply methods of enhanced oil recovery and develop new production techniques, accumulating engineering experience and innovation. As was highlighted earlier, most of the development of deposits with high depletion in the USA is done by small and medium-sized businesses. Thus, the flexible taxation system described above allows independent small and medium oil companies to stay in business. In some cases, a special tax regime exists for oil production that uses enhanced oil recovery methods and new technologies. For example, in Texas the tax rate for enhanced oil recovery is 50% of the conventional oil tax rate. This rate is valid for 10 years. It is important to note that taxation differentiation depending on field depletion requires that regulatory institutions be strong and transparent, and in particular, that the regulators not be corrupt. Without these elements, numerous tax benefits can just lead to a reduction in the country’s tax revenue, without any real progress in increasing oil production in fields with high depletion or in improving the industry’s innovative development. Hence, in order to adopt the US best practices of the effective fiscal system, other countries should draw their attention to the quality of their institutional environment and their level of corruption. The US regulation system is fine-tuned. Subsoil users are obliged to submit an annual audit of reserves to The United States Securities and Exchange Commission. Also, according to US licenses for oil and gas production, a subsoil user should report on the daily production of each well for the previous month. The inspectors have unimpeded access to all the facilities in operation, records, reports, and materials, and notify the license holder of violations of rules, instructions, and stipulated conditions. Effective and transparent regulation is a cornerstone of an efficient and flexible taxation system. From the brief analysis presented in this section one can conclude that the main aim of taxation policies in US subsoil resource management is to create conditions in which companies can invest in the development of new innovative production methods. At the first stage these methods are rather costly, but with experience, their cost declines and they become available for other companies. So, for example, as a result of engineering experience, it now takes just 14 days to drill a well in the USA. The effective taxation policy in the USA has played a significant role in forming the segment of innovative independent medium and small businesses. Further, the accumulated experience of these companies has considerably influenced the development of shale resources. The aim of this section is to demonstrate empirically that factors of institutional development played a significant role in the growth of shale gas production in the USA. In the context of the USA we show that in the presence of strong institutions and with the accumulation of innovative experience, conventional hydrocarbon production is supplemented by unconventional (assuming that considerable reserves of the latter are available in the country), thereby increasing the total volume of hydrocarbon production in the country. Statistics were provided by the Independent Petroleum Association of America (IPAA) and Bureau of Land Management (BLM). The period of observation is 32 years (from 1985 to 2011). The econometric modeling was carried out on the basis of Multivariate Multiple Regression, based on OLS estimates. Accumulated investments in research and development of independent companies, in billions of US dollars (as a factor of the innovative development of the industry). The model also included such parameters as prices for oil and gas, because their role in the production dynamics of both conventional and unconventional hydrocarbons is significant. The following regression results were obtained as a result of econometric modeling using the parameters listed in Table 2. The R2 parameter of the obtained regression is equal to 0.72. It allows us to conclude that on the whole the regression is significant. A Breusch–Pagan test revealed the heteroscedasticity, due to which the robust estimates of the parameters were adopted. Only parameters that are significant at the 10% significance level are provided in Table 2. Table 2 shows that there is a positive dependence of the share of shale gas in the total US production on practically all the considered factors. 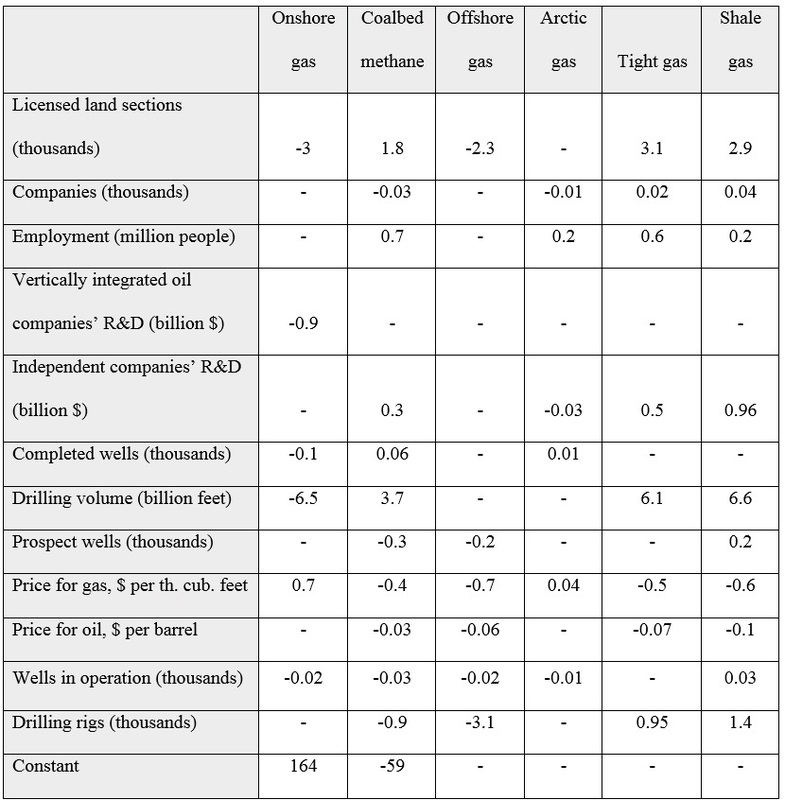 The following indicators most influenced the share increase in this type of hydrocarbons: accumulated licensed land sections (share increase by 2.9 percentage points with indicator growth by 1000), independent companies’ R&D (share increase by 0.96 percentage point with indicator growth by 1 billion US dollars), drilling volume (share increase by 6.6 percentage points with indicator growth by 1 billion feet), drilling rigs (share increase by 1.4 percentage point with indicator growth by 1000). It should be noted that there is a strong positive dependence between shale gas production and independent companies’ investment in R&D. Meanwhile, the influence of investments into scientific research by vertically integrated oil companies turned out to be insignificant. This once again demonstrates the greater role of innovative independent companies in shale gas production in comparison with vertically integrated oil companies. Tight gas has a similar tendency to increase its share in the total production with the accumulation of the investigated factors, as does shale gas. Both types fall under the category of unconventional hydrocarbons. All in all, the accumulation of the analyzed factors has a positive effect on the share of total unconventional hydrocarbon production. Table 2 also shows that with the growing number of accumulated factors analyzed in the model, the share of conventional natural gas (especially onshore gas) in the US total production decreases – thereby replacing conventional with unconventional gas. Offshore also tends to decline within the share of total production with the growth of the analyzed factors. From the results of the econometric modeling and analysis provided above, one can conclude the following: It was demonstrated empirically that the accumulation of the analyzed factors, which are quasi-parameters of innovative development and the institutional environment, has a positive effect on the increase in the share of the unconventional hydrocarbons, including shale gas, in US production. Due to high innovative development and strong institutions the USA made a transition from almost exclusively conventional gas production to unconventional production. The impressive success of the USA in shale gas production led to increased interest in unconventional hydrocarbons worldwide. Many countries are making efforts to estimate their shale gas reserves and to develop them. But the progress of shale gas development outside the USA is currently very limited. For that reason it is important to understand what factors have led to the shale revolution in the USA. In technical terms, the shale revolution was enabled by technologies that made shale gas production profitable. The important factors are high prices for gas at the beginning of the 2000s, which stimulated production, including production from unconventional sources. However, the principal factor was high institutional development, which created the right conditions for innovations in the sector. Private property for subsoil resources, the variety of types of business entities operating in the oil and gas sector (including small businesses) and a favorable tax regime should be highlighted among the factors in US institutional development. An efficient and transparent regulatory regime also played a significant role. Besides the qualitative description of the factors mentioned above, an empirical estimate of the influence of the institutional environment parameters on the growth of hydrocarbon production from unconventional sources was presented in the article. In the context of the USA, it was demonstrated that factors of innovative development and a strong institutional environment have a positive influence on the growth of unconventional hydrocarbons, including shale gas, in the country’s total production.